Stanley O'Neal formerly of Merrill Lynch (left), James Cayne formerly of Bear Stearns (middle) and Charles Prince formerly of Citigroup (right). The CEOs of three of Wall Street's biggest investment banks lost their jobs within a two and a half month period between October 2007 and January 2008 as the result of overwhelming losses suffered by their respective firms, basically, due to poor credit decisions. Since their departures, Merrill Lynch has been taken over by Bank of America; Bear Stearns by JP Morgan Chase and Citigroup, though still independent, continues to struggle with write-offs and liquidity shortages. Over the past decade, in an environment of cheap money and sustained economic growth led by exports and consumer spending, Wall Street investment firms and their global counterparts discovered that soaring profits could be generated through high yield bond offerings based on the riskiest loans in existence -- sub-prime mortgages. For a time, the investment appetite for these high risk mortgage-backed securities was so great that Wall Street firms stoked demand even further on the supply side by infusing capital, or in some cases even acquiring, the very mortgage companies that were generating the high-risk loans. The losses are still mounting. As of April 2008, the write-down tally stood at approximately $215.86 billion from a collective group of 15 different banks and investment firms, according to WSJ Market Research. To put the losses in perspective, consider the fact that the loss tally, thus far, would represent the 28th largest economy in the world exceeding the individual GDPs of South Africa, Greece and Finland. These massive losses have served to create one of the worst credit and liquidity environments in recent history. "I don't think there's a choice in the modern capital markets for firms like us not to take risks," Stanley O'Neal said defiantly in a video shown to Merrill employees on October 5, 2007, according to an article that appeared in the Wall Street Journal the following week. Just three weeks later, the Merrill Lynch board of directors forced O'Neal to resign after 21 years at the firm. Since becoming CEO in December 2002, O'Neal pushed to expand Merrill's role in the underwriting of collaterilized debt obligations or CDOs. CDOs are simply pools of high risk, high yield securities that are collaterlized by various levels of high-risk debt, in many cases mortgage debt. 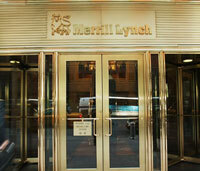 By 2006, Merrilly Lynch had become Wall Street's leading underwriter of CDOs, according to the Wall Street Journal. months after being named CEO. In the months leading up to the credit crunch, and even soon thereafter, O'Neal made one questionable move after another. In July 2006, just as high risk investments were starting to take their toll on the credit markets, O'Neal replaced a veteran group of risk managers led by Jeffrey Kronthal -- who Merrill had brought in just a few years earlier to help manage the CDO portfolio -- with a younger less-seasoned team, according to a WSJ article. The dismissal of Kronthal and its timing are significant in understanding how O'Neal was mismanaging an important part of the company at a very critical time. It also underscores an important reality in the world of credit and risk management: The credit and risk culture of the entire organization often starts at the very top. Kronthal, who was senior vice-president of credit, real estate and structured products, had overseen the firm's expansion into CDOs and other structured financial instruments. However, in mid-2006, Kronthal and two of his associates in structured finance started sounding alarms about the firm's rising mortgage exposure. It was also about this time that investor appetite for CDO backed securities began to weaken. What's more, some credit insurers were retreating from hedging Merrill's risks. But warning signs didn't seem to matter to O'Neal who as late as September 5, 2006 made a move that plunged Merrill Lynch ever deeper into the burgeoning sub-prime quagmire by acquiring San Jose, California-based First Franklin Financial Corporation, one of the nations leading originators of sub-prime residential mortgage loans. "This transaction accelerates our vertical integration in mortgages, complementing the three other acquisitions we have made in this area and enhancing our ability to drive growth and returns," said Dow Kim, president of Merrill Lynch's Global Markets & Investment Banking Group. Just over a year later, on October 25, 2007, Merrill Lynch announced it would take a $8.4 billion hit to third quarter earnings, one of the largest in Wall Street history, due to mortgage-related losses. In a desperate attempt to save his job, and create the appearance of internal controls within the firm, O'Neal created a new position by naming a company-wide chief risk officer, a position eerily similar to the one Jeffrey Skilling created at Enron. In the end, it proved too little, too late. On October 30th, O'Neal's Merrill career came to an end. Two months later, Merrill Lynch rehired Jeffrey Kronthal as a consultant. In July 2007, James Cayne, the 73-year-old CEO of Bear Stearns, the fifth largest investment bank in the country, spent 10 of 21 working days playing either golf or bridge in Nashville, Tennessee, according to an article in the January 8, 2008 edition of the Wall Street Journal. Meanwhile, back on Wall Street, two of Bear's highly leveraged, high risk mortgage-related hedge funds backed by securities purchased with the firms own capital were imploding. Although, the firm, once considered the most risk-astute on Wall Street, initially withstood the crash of the two hedge funds, the peristent rumors of cash shortages coupled with the firms plumeting stock price eventually caught up to it. As Roddy Boyd wrote in a March 31, 2008 article in Fortune, "It's a reminder that in a business based on confidence, when that confidence evaporates, so does the business." Some of Bear's liquidity problems were the direct result of the firm having earlier acquired and repackaged securities backed by mortgage loans that were too risky. 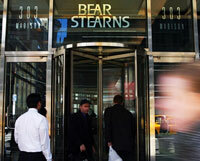 What's more, Bear Stearns had pooled too many of them together with too much debt. This was done to increase the yield, if, and only if, the gamble paid off. It didn't! "Had most of their [the Bear Stearns hedge funds] assets been of greater credit quality, the problem would not have been as severe," wrote Larry Swedroe, the former vice-president and regional treasurer at Citicorp who is now the director of research for BAM Advisor Services. To what extent Cayne, as CEO, was involved in the poor risk management policy decisions that eventually led to Bear's implosion, such as we know was the case with Stanley O'Neal at Merrill Lynch, is uncertain. At least towards the end, Cayne did not appear to be a very hands-on CEO. But what is certain, is the apparent lack of concern and management prowess on Cayne's part at a critical point in the once venerable firms history. On August 6, 2007, Cayne responded to the hedge fund fiasco by dismissing his co-president Warren Spector, a 49-year-old former mortgage-securities trader whom was widely thought to be Cayne's successor. To date, Spector was the highest profile casualty in the building sub-prime mortgage crisis. However, by January 2008, after Bear recorded the first quarterly loss in its 84-year history and client and investor confidence continued to spiral downward, the Bear Stearns board -- many of them handpicked by Cayne -- had reportedly seen enough. On January 8th, James Cayne resigned after 39 years with the firm, the final 14 as CEO. Alan Schwartz, the head of investment banking at Bear Stearns, assumed the CEO mantle but could not restore client and investor confidence, critical since Bear was seeking to borrow money from a field of lenders on Wall Street, all of which were saying no. Unable to remain solvent without help and no lenders in sight, on the Sunday night of March 16, 2008, Bear Stearns agreed to be sold to JP Morgan Chase for an astounding $2.00 per share. Just a year earlier the stock was trading at $170 per share. The Federal Reserve guaranteed $30 billion of Bear's debt to prevent the deal from going bust and to prevent the liquidity fire from speading to other banks. On January 16, 2008, the lead editorial of the Wall Street Journal read, "Too Big to Succeed?" The editors were referring to Citigroup. The WSJ editorial then sized up Citigroup this way: "From the sovereign debt crisis of the 1980s, to its entanglement in Enron's fraud, and now subprime and the SIVs, Citi has shown a knack for finding the middle of whatever financial mess is in the news. Over the years, Citi's size has not so much provided stability as a place for problems to hide." Merrill Lynch had a credit risk management apparatus in place, but failed to use it at a time when it was needed the most. Bear Sterns had long been known as a credit and risk astute establishment until its management, by most accounts, veered away from the risk and growth balance that had made the firm famous on Wall Street. Citigroup's overall size, vast global presence and high growth philosophy have more-than-likely made any kind of structured, organized approach to credit and risk management virtually impossible. The bank has more than 200 million customers and does business in over 100 countries, according to its 2007 annual report. Size constitutes a major impediment to effective credit and risk management, as evidenced by Citigroup's current struggles and by research conducted by CreditPulse. Case-in-point: The average annual revenue for companies in the highest credit classification of the 2005 CSI was $1.08 billion while the average annual revenue for companies in the lowest of the four classes was $5.88 billion. On October 16th of this year, Citigroup, with 2007 revenues net of interest expense of $81.7 billion and total assets of approximately $2.2 trillion, announced it would post its fourth straight quarterly loss -- this one in the amount of $2.8 billion. Citigroup's losses over the past 12 months total $20.2 billion. In addition, revenue after interest expense decreased from $89.6 billion in 2006 to $81.7 billion in fiscal year ended December 31, 2007, an 8% decrease although total interest revenue grew from $96 billion in 2006 to $124 billion in 2007. Long-term debt is $427.1 billion, over five times annual net revenue. 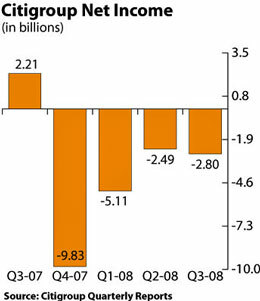 The magnitude of the fourth quarter 2007 loss coupled with the bank's bleak outlook resulted in the resignation of CEO Charles Prince on November 3, 2007. Since then, the bank has lost some 62% of its market capitalization, eliminated its dividend to shareholders and cut some 23,000 jobs. What's more, the credit crisis has dried up one of Citi's major sources of cash, commercial paper. The Citigroup annual report ranks commercial paper fourth behind deposits, collateralized financial transactions and debt as a key source of liquidity. In recent months, Citi has been forced to go hat-in-hand to large global investors such as Singapore's Government Investment Corp, Prince Al-Waleed bin Talal of Saudi Arabia who bailed Citi out in the 1990s and the China Development Bank in order to maintain enough liquidity to continue to fund its operations. The China Development Bank decided against investing in Citi, a major red flag since the Chinese rarely pass up an opportunity to acquire notable foreign assets. from 1999 to 2003, chairman until 2006. To be fair, not all of the problems at Citi can be attributed to Charles Prince. Prince took the helm at Citigroup on October 1, 2003 after Sanford (Sandy) I. Weill, Citigroup's former Chairman and CEO was forced to give up the title of CEO in the wake of both Citi's involvment in the Enron scandal under his tenure and Weill's direct personal involvement in the controversy surrounding analyst Jack Grubman that cast doubt on Citigroup's integrity. 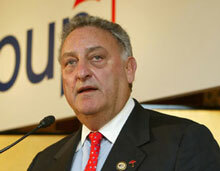 Many of the seeds of the bank's current problems -- principally its unwieldy size and unbridled growth -- were planted under the leadership of Weill who served as Chairman of the Board and CEO from 1999 to 2003 before resigning as CEO but maintaining the Chairman post until resigning from that position in April 2006. Citigroup, already among the largest banks in the world, went on an acquisition binge under Weill often acquiring companies unrelated to Citi's core banking operations. 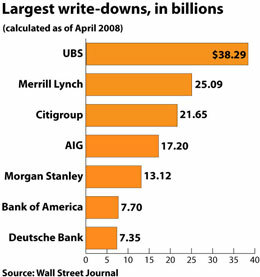 A November 5, 2007 WSJ article refers to Citi as "an often dysfunctional collection of businesses whose employees sometimes ignore or even compete against each other." Weill used Citi's acquisitions to boost revenue, which in turn helped to boost the bank's stock. With more equity capital came more money for acquisitons. This formula seemed to work as long as the stock market kept climbing and sufficient numbers of research analyst offered buy ratings on Citigroup's stock. Like Merrill Lynch and Bear Stearns, Citigroup is faced with major liquidity and even solvency issues due in part to its over-reliance on booming credit and equity markets. However, unlike Merrill Lynch and Bear Stearns, Citigroup is involved in just about all facets of the debt securitization world ranging from its own structured investment vehicles or SIVs to the distribution and use of commercial paper to various forms of debt refinancing. Like CDOs, SIVs are complex bankruptcy-remote special purpose entities that sell debt securities to investors seeking high yield invesments. Citigroup has been involved in this type of financial instrument for years and, up until early this year, was the largest participant in the $350 billion SIV market, according to an article in the WSJ. Typically, SIVs have distinguished themselves from CDOs by the quality of their underlying assets. However, in the past couple of years Citigroup, like Bear Stearns and Merrill Lynch, began structuring vehicles that contained sub-prime mortgages. Like Merrill, Citi plunged into the sub-prime mess even deeper in September 2007 when it acquired AMC Mortgage Services, which services $45 billion in subprime mortgages. The deal made Citigroup the nations second largest servicer of sub-prime loans, according to an article in the WSJ. The job of leading Citigroup now falls upon Vikram Pandit who was named CEO in December 2007.